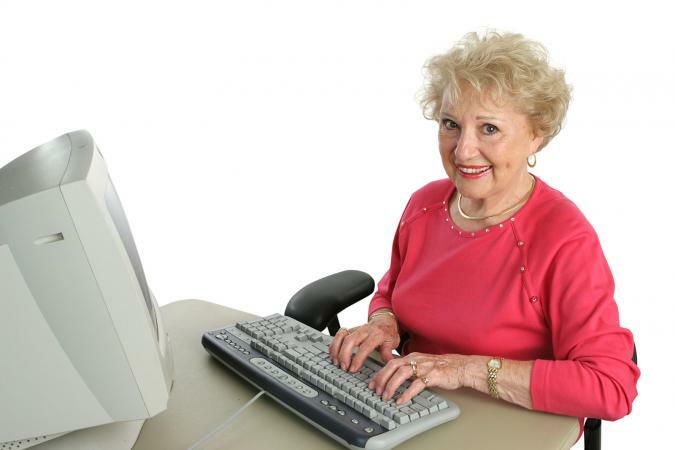 Large print keyboards are helping millions of seniors remain active online. If you're experiencing difficulty distinguishing one key from another, maybe it's time you learned more about the latest technological innovations. If you're not anxious to go to the trouble and expense of replacing your current keyboard, you can still enjoy the benefits of larger print by converting your keys with stick-on labels. Large print sticker labels can double the character size on your old keyboard. Kits also come in different color combinations so you can choose the level of contrast your eyes are most comfortable with. Options also include lower or uppercase lettering. The average price per sticker kit is approximately $17. If you're ready to take the plunge and replace your old keyboard, you're going to need to do a little research before you shop. Take a look at some large print options available on the market today. Keys-U-See® boasts having the largest key prints available, as well as one-touch Internet, e-mail and media control keys. Boards are available in three color combinations, and most models come with PS2 adaptors for your USB connectors. This model is one of the most affordable at this quality level, averaging around $40. The Visionboard™ from Chester Creek Technologies is designed for anyone with vision problems, as well as people who suffer from lowered dexterity caused by arthritis.Large, bold characters make this keyboard extremely easy to see, and the increased key size makes it easier to punch the exact key you're looking for without catching its neighbor at the same time. If you've ever felt like you were typing with potatoes for fingers, this just might be the enlarged keyboard for you. The VisionBoard retails for around $70. ZoomText big print keyboards utilize all the usual large print features and more. This board can be purchased separately or used in coordination with the ZoomText system that gives you the power to change your screen magnification levels and launch the system's DocReader and AppReader programs. The keyboard retails for $129. With varied colors and larger text for individual keys, the Big Keys LX Keyboard makes typing easier for those who have difficulty seeing standard keyboards. Each key is 1" and the color coding makes it easier to distinguish one key from another. This keyboard is available for around $170. Are you finding it difficult to read print these days? You're not alone. Millions of people suffer from some level of visual impairment, whether it's mild or severe, and it can make keeping up with daily functions a real challenge. Our world is geared toward people with at least average vision, so most novels, magazines, and newspapers utilize standard-sized print. Computer keyboards follow suit, so it can be even harder to stay connected to the information super-highway. Fortunately, there are some solutions at hand. Large print keyboards can make your computer user-friendly once again, increasing the letter size by as much as 100 percent in many cases. This means no more straining to tell a semi-colon from a comma, and no more headaches and neck pain from crouching over the keys as you hunt and peck. Instead, you'll find nice large characters you can see without a magnifying glass. Do You Need Large Print? Do you find yourself squinting to read your keys? Are your documents and e-mails riddled with errors? Do you get a headache and/or tired eyes every time you use your current keyboard? Do you avoid using your computer because it's just become too difficult to deal with? If you answered yes to one or more of these questions, chances are you could benefit from enlarged print. Even people with good vision often find large print keys easier to use in low-light situations. Why struggle with your standard keyboard when you don't have to? Today's large print keyboards take the frustration out of using your computer, and with so many features and price ranges available, there's bound to be a model to suit anyone's needs.